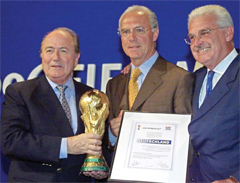 A photo taken on July 6, 2000, shows German bidding committee leader Franz Beckenbauer (C) posing with FIFA president Joseph S Blatter (L) and German delegation member Fedor Radmann after Germany was designated to host the 2006 FIFA soccer World Cup by the vote of the FIFA executive committee in Zurich. BERLIN: Franz Beckenbauer is under growing pressure to explain his part in Germany’s 2006 World Cup scandal amidst reports of a document pointing the finger at the legendary player and coach. German football has lurched into a crisis over magazine Spiegel’s report last month alleging that the votes of four members of FIFA’s executive committee were bought in 2000, when Germany narrowly won the vote to host the 2006 finals. At the centre of the scandal is a 6.7 millioneuro ($7.2m) payment, which is alleged to have been used to purchase the support of FIFA’s executive committee. The scandal took a dramatic twist last week when police carried out raids at the Frankfurt headquarters of the German Football Association (DFB) and led to Wolfgang Niersbach resigning as DFB president on Monday. State prosecutors have revealed three men-including Niersbach, ex-DFB president Theo Zwanziger and ex-general secretary Horst Schmidt-are being investigated for serious tax fraud surrounding the FIFA payment. Despite his pivotal position in the 2006 World Cup-first in leading the successful bid and later as chairman of the tournament’s organising committee — Beckenbauer, 70, has stayed tight-lipped in the last fortnight, even as Niersbach took “political responsibility” in resigning as DFB boss. But now German daily Bild claims to have seen a draft agreement, signed in part by Beckenbauer, which it says was aimed at “buying votes for the German bid”. Munich-based Sueddeutsche Zeitung also quoted sources having seen the same document, reportedly signed in July 2000, just four days before Germany beat South Africa by 12 votes to 11 for the right to host the 2006 World Cup finals. Beckenbauer is already being investigated by FIFA’s ethics committee, which is looking into the controversial awarding of the 2018 and 2022 World Cup finals to Russia and Qatar respectively. But ‘the Kaiser’ is under increasing pressure to shed some light on the 2006 World Cup scandal in Germany. “I expect those who can contribute to the cleaning up, to do so,” said Germany’s Interior Minister Thomas de Maiziere on Tuesday.